With an overnight bus to take us from our mountain bike tour of Cappadocia straight to Mt Nemrut, we never thought much about the idea of taking a rest before hiking up 3,000 feet of elevation. After our bike ride in Cappadocia we were able to fall asleep on our bus before we even pulled out of the station and didn’t wake up until we’d arrived at our destination….still it wasn’t enough and I was due to pay for it. 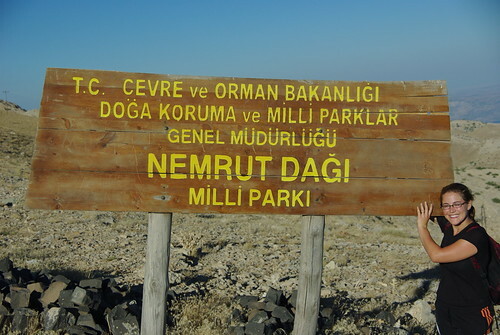 The peak of Nemrut Dagi is over 2,100 meters in elevation marking the highest we’ve been in quite sometime. The peak though is something of a shame, it’s not real. The mountain was chosen by a pre-Roman king wanted to sit amongst some gods whom he considered his relatives and carved a nice ledge for some giant statues (with even bigger heads). This wasn’t enough though, he then created a big hill of rocks up the mountain to be made into a new summit to serve as his eternal tomb. Gotta love those monarchs. The walk, truly, was easy enough. Follow the road from just outside our pension and don’t deviate until we see some giant stone statues. We started walking around 2pm, giving us plenty of time to get there before sunset. We were exhausted though, and I walked nice and slow. We watched as a horse escaped its pen and was chased through the hills by its master. I stopped to say hello to some cows and to admire a street sign that had been completely covered in bird droppings. I looked for any excuse to stop… I was exhausted and the 3 hour hike took me a solid 4 hours….and I was doing it without any gear. 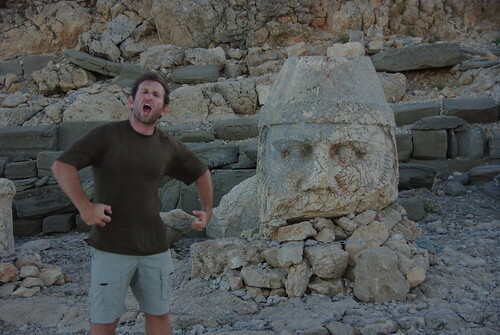 Some people like to climb Nemrut and spend a night at the top and get up for sunrise. The wind in the evening was enough to make me sure that wasn’t in the cards for us….sunrise looks the same as sunset anyhow. When we gazed at those giant heads, sitting on the ground in front of the wrong statues (the heads were too big to be supported by their bodies and fell, they were stood back up by modern archaeologists) I thought they looked a touch small but didn’t leave without taking a chance to flex my muscles in front of Hercules. 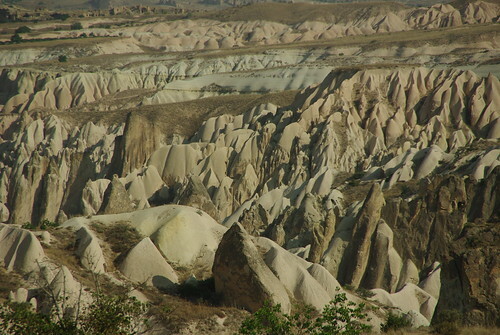 IF YOU GO: We went directly from Cappadocia to Kahta which is the nearest town to Nemrut. We stayed on the slopes of the mountain in the town of Karadut which was easy enough to reach with a minibus from Kahta. 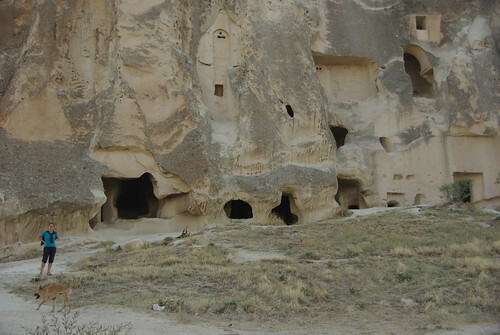 There was no need to purchase a tour from Cappadocia or from within Kahta, we were able to get to Karadut via bus and walk the remaining 12km walk on our own without a problem. There are some other small archaeological sites in the area though and if you are interested in seeing those, then a tour would be advisable. 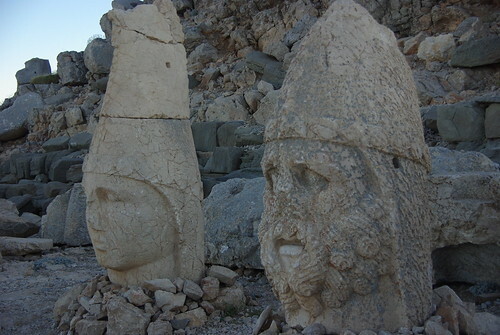 All four hotels in Karadut offer transportation to/from Nemrut for about 50 TYL round trip per car. From Kahta it is easy to get to Adiyman or Sanliurfa which serve as local transportation hubs to the rest of the country. We stayed at the Karadut Pension and a quick call to the owner provided us with mini-bus instructions to reach his place from Kahta. If the word ‘pizza’ comes from the word ‘pita,’ then the ‘pide’ must be the missing link. If you can imagine a canoe shaped pizza, (New York style, not that nasty, greasy stuff from Chicago) then you can imagine a pide. (Editor’s Note: Ahem, what Danny?) The toppings are usually a bit different bit different than we’d have at home however. 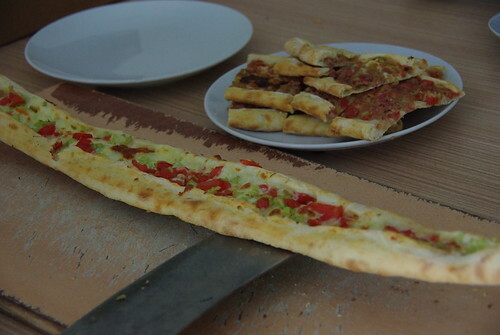 The most common pide is the Kymali, my favorite, which is a mix of peppers, onion and minced meat. Sometimes other Mediterranean treats such as olives and cheese are added as well but this usually isn’t a Kymali then, it’s another type of pide. There are many to choose from, just like back in the US. Because it doesn’t always have cheese, and isn’t a full circle, it actually makes a fairly light meal as compared to most pizza I’m used to. We often share a pide when we’re snacking, or each have our own when we’re actually in for a meal. Over our three days in Cappadocia, we went to the same pide place three days in a row. A full pide there cost a mere five Lira or about $3.30. The restaurant came to know us so well that they didn’t mind when I invaded their kitchen to take a few photos for the blog. Picture this: two volcanoes. One explodes and spews soft rock. The second explodes and covers that soft rock with hard rock. Over time water eats away at both rocks, but the hard protects the soft below it. People arrive, want to hide from various empires and dig themselves into the soft rock. 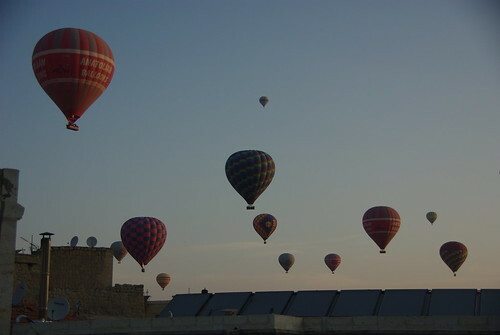 That is a short history of Cappadocia. Our tour of Cappadocia continued like this for two days, visiting strange rock formations and staring at the incredible power of wind and water. We visited tremendous underground cities. Yes, I used the word city, each one once held several thousand people. The Goreme Open Air Museum was a collection of cave dwellings and monasteries carved into the cave walls with byzantine frescoes adorning the walls and ceilings. Strange towers rose from the ground where the hard rock on top protected the soft rock below from centuries of water, and souvenir shops were never in short supply. We did manage to do more than just some site-seeing. We rented mountain bikes for the first time since we biked Kruger NP in South Africa. Against the suggestion of our rental agency, we took those bikes through one of the narrowest canyons in the Cappadocia area, without a decent map or a compass. Don’t worry, it doesn’t end badly. In fact, we pulled, hoisted and hiked those bikes along a precarious trail. At one point we had to use ropes to pull ourselves and those rental bikes up and over giant rocks. The few times we were able to ride, we took those bikes through caves and under gorgeous arches. Pulling our bikes up a rather steep hill at the end, we caught an Italian tour group off guard. Staring at us in disbelieve, the souvenir shop owner offered us water and juice (for a price of course) and tried to sell us her hand made lace. Opting instead to celebrate with baklava and yummy pides, we coasted downhill back to Goreme, arriving two minutes before the bikes had to be returned. IF YOU GO: We were lucky enough to be traveling with a pair of Aussies from our Blue Cruise and shared a car rental for about $60 for a very nice 24 hours. This probably worked out in our favor but not by much. 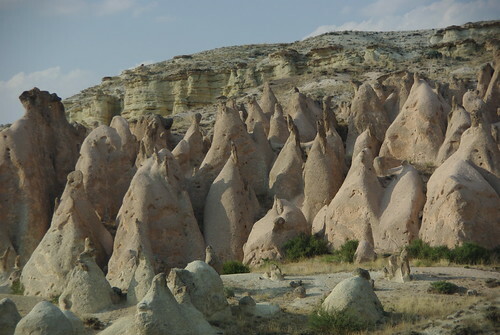 The tour prices are reasonable if you want to see everything but Cappadocia is a perfect place to just go for a walk through the surrounding canyons (if you base yourself in Goreme) and take an occasional bus trip to a nearby city to see an underground city. We stayed in the Nomad Cave Hotel and had a very nice time there in our own cave room with breakfast, dormitories were also available. 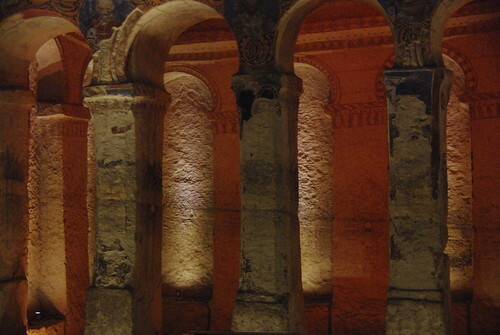 We took a direct overnight bus from Olympos to arrive in Goreme but there are connections to Goreme from all major cities such as Istanbul and points further east. You might have to connect through one of the nearby larger cities such as Kayseri, however, which is also home to the main airport. We walked nearly 8km from our hotel to the Chimera thanks to some mis-information. Finally arriving at the site after about an hour and a half walking in the thick humidity, we were drenched and not exactly happy to see more heat. That was until I remembered that the flames supposedly couldn’t be put out and for research purposes only of course, I decided to try my hand. My first attempt, splashing a little water on a small flame, put the flame out momentarily, but it quickly returned. Thinking it would make a great video for the blog, I moved to a slightly larger flame and instructed Danny to film. Sprinkling water on the flame, it didn’t even flicker and Danny urged me to splash more on. Slowly at first and then with a little more zeal, I splashed water out of my Nalgene onto the flame. Sure enough it went out with a loud sizzle. We waited….and waited. Embarrassed, although you can’t hear this on the video, I decided the best thing to do was to stop filming and walk away quickly and silently. At this point Danny and our Turkish friend Baris were audibly laughing at me claiming I had doused the eternal flame. For the record, we left 20 minutes later and the flame still had not returned, but to be fair, I did see some match like pieces at the base of one of the flames. You’re probably thinking, Chimera, Chimera, where have I heard that name before? High school, Greek Mythology. The fire breathing monster appears in Homer’s the Iliad as a creature of Lycia: “a thing of immortal make, not human, lion-fronted and snake behind, a goat in the middle and snorting out the breath of the terrible flame of bright fire.” The Greek myth is said to have been inspired by the “eternal flames” (or are they) above Olympos on Mount Chimera. No one will ever know the truth, but its safe to say that spotting of the Chimera in ancient times was seen as a bad omen. Likely because you were about to hit shore. 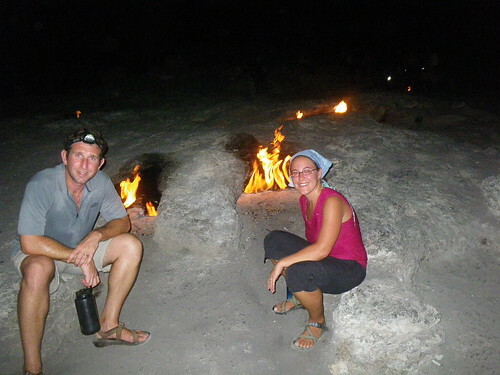 If You Go: Tours run every night from Olympos for about 20TL. 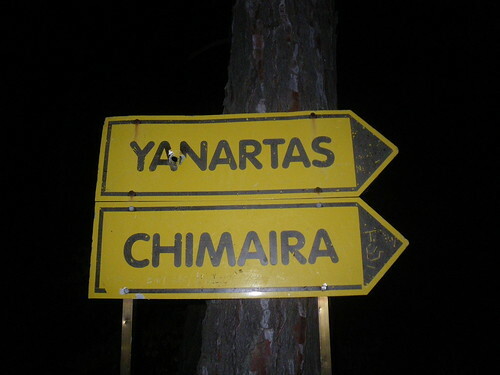 The walk is relatively flat, but prepare to ask for directions as signage for “Yarnartas” is few and far between. 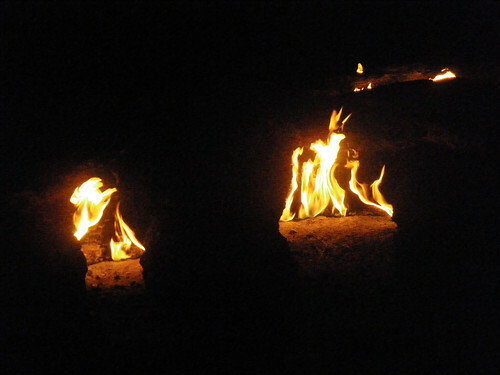 It’s about 7km from Olympos to the Chimera, and you should bring a light for the rocky beach. We took a taxi from the entrance back to the beach and walked back to Olympos from there. Call the dentist! Baklava is probably the only dessert in the world that I can have just one piece and walk away. It’s seriously sweet. 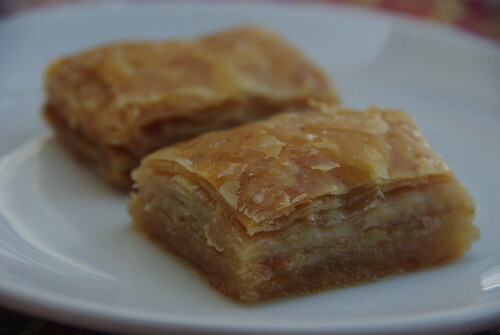 A combination of phyllo dough, honey and nuts, baklava is a national dessert here in Turkey. But don’t tell that to the Syrians, Lebanese, Greeks or pretty much anyone else between here and Mongolia who also claim baklava as their own. Made in enormous trays, cut and sprinkled with pistachios, baklava is decadently sweet. Ramadan’s evening meal, Iftar, seems to always include dessert. It’s no wonder given how delicious they are here in Turkey, and I swear since Ramadan started I’ve seen more and more Baklava sold on the streets. It is advertised in nearly every shop window, and by late afternoon the smell of baked goods is wafting through the street. Don’t ask me how Muslim’s keep their fast after walking by a pastry shop! Yum! Baklava looks like it’s a little intense to prepare, but here’s a recipe that will hopefully make it easier!